I’m giving away two copies of John Ferrara’s new book, ‘Playful Design’ and two copies of ‘Storytelling for User Experience’ by Whitney Quesenbery & Kevin Brooks. Whether you are a UX Professional or enthusiast Usability Evangelist, you’ll surely appreciate these two books. To enter, just follow the instructions below. Make sure you’re following Paul Olyslager on Twitter. 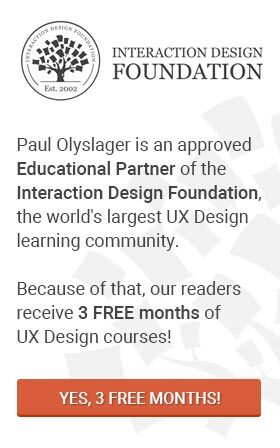 Publish a tweet that says, “Hey @paulolyslager, do I win a copy of Playful Design or Storytelling for User Experience? http://bit.ly/R9UClB”. Make sure you’ve ‘liked’ Paul Olyslager on Facebook. Post a message to the Paul Olyslager wall (not your own wall) with your response to the following question: “What department or executive owns, supervises, or is responsible for UX in your organization?”. Visit Paul Olyslager’s subscription page or scroll down ’till you see the grey subscribe box. Fill in name and email address. Don’t you worry if you’re already subscribed. You can still enter this contest by emailing your answer to [email protected]. Four winners will be chosen from amongst the valid entries. The giveaway ends on Friday, September 14th. Winners will receive the following formats of the book: Printer-optimized PDF, Screen-optimized PDF, ePub and MOBI. Editorial note: The contest has concluded. Find out if you are one of the lucky winners of ‘Playful Design’ or ‘Storytelling for User Experience’.